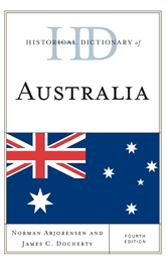 Editors: Abjorensen, Norman and Docherty, James C.
This fourth edition of Historical Dictionary of Australia covers its history through entries on important personalities, politics, economy, foreign relations, religion, and culture. ABBOTT, ANTHONY JOHN “TONY” (1957– ). ABORIGINAL AND TORRES STRAIT ISLANDER COMMISSION (ATSIC). AUSTRALIAN CHAMBER OF COMMERCE AND INDUSTRY (ACCI). Australian Competition and Consumer Commission (ACCC). AUSTRALIAN COUNCIL OF TRADE UNIONS (ACTU). AUSTRALIAN MANUFACTURING WORKERS’ UNION (AMWU). AUSTRALIAN MUTUAL PROVIDENT SOCIETY (AMP). AUSTRALIAN SECRET INTELLIGENCE SERVICE (ASIS). AUSTRALIAN SECURITY INTELLIGENCE ORGANISATION (ASIO). BARWICK, GARFIELD EDWARD JOHN (1903–1997). BEAN, CHARLES EDWIN WOODROW (1879–1968). BLACKBURN, ELIZABETH HELEN (1948– ). BLAINEY, GEOFFREY [NORMAN] (1930– ). BORRIE, WILFRED DAVID [“MICK”] (1913–2000). BOYD, ROBIN [GERARD PENLEIGH] (1919–1971). BROKEN HILL PROPRIETARY COMPANY LIMITED (BHP). BRONHILL, JUNE [GOUGH, JUNE] (1929–2005). BUSINESS COUNCIL OF AUSTRALIA (BCA). CAIRNS GROUP OF FAIR TRADERS IN AGRICULTURE. CHIFLEY, [JOSEPH] BEN [BENEDICT] (1885–1951). CLARK, [CHARLES] MANNING [HOPE] (1915–1991). COMMUNIST PARTY OF AUSTRALIA (CPA). CONFEDERATION OF AUSTRALIAN INDUSTRY (CAI). COOMBS, “NUGGET” [HERBERT COLE] (1906–1997). CORAL SEA, BATTLE OF THE. Council of Australian Governments (COAG). DAVID, [TANNATT WILLIAM] EDGEWORTH (1858–1934). DEFENCE OF GOVERNMENT SCHOOLS (DOGS). DENNIS, C[LARENCE MICHAEL] J[AMES] (1876–1938). DOHERTY, PETER CHARLES (1940– ). DUNSTAN, DON [DONALD ALLAN] (1926–1999). “DUSTY, SLIM” [KIRKPATRICK, DAVID GORDON] (1927–2003). FEDERATED MISCELLANEOUS WORKERS’ UNION (FMWU). FORDE, FRANCIS MICHAEL, “FRANK” (1890–1983). FRASER, [JOHN] MALCOLM (1930– ). GILLARD, JULIA EILEEN (1961– ). HAWKE, “BOB” [ROBERT JAMES LEE] (1929– ). HERBERT, [ALFRED FRANCIS] XAVIER (1901–1984). HOPE, A. D. [ALEC DERWENT] (1907–2000). HOWARD, JOHN WINSTON (1939– ). HUGHES, ROBERT STUDLEY FORREST (1938–2012). HUMPHRIES, JOHN BARRY (1934– ). INGAMELLS, REX [REGINALD CHARLES] (1913–1955). INSTITUTE OF PUBLIC AFFAIRS (IPA). KEATING, PAUL JOHN (1944– ). KENEALLY, THOMAS MICHAEL (1935– ). KINGSFORD SMITH, CHARLES EDWARD (1897–1935). LANG, JACK [JOHN THOMAS] (1876–1975). LAWLER, RAY [RAYMOND EVENOR] (1921– ). LAWRENCE, CARMEN MARY (1948– ). LEICHHARDT, [FRIEDRICH WILHELM] LUDWIG (1813–1848). LINDSAY, NORMAN ALFRED WILLIAM (1879–1969). MACKELLAR, [ISOBEL MARIAN] DOROTHEA (1885–1968). MACKERRAS, [ALAN] CHARLES [MACLAURIN] (1925–2010). MAY, ROBERT MCCREDIE (1936– ). METAL TRADES INDUSTRY ASSOCIATION (MTIA). MURDOCH, [KEITH] RUPERT (1931– ). MURRAY, LESLIE ALLAN, “LES” (1938– ). NATIONAL GALLERY OF AUSTRALIA (NGA). NATIONAL INSTITUTE OF DRAMATIC ART (NIDA). NATIONAL LIBRARY OF AUSTRALIA (NLA). NOSSAL, GUSTAV JOSEPH VICTOR (1931– ). OLIPHANT, MARK [MARCUS LAURENCE ELWIN] (1901–2000). PAGE, EARLE CHRISTMAS GRAFTON (1880–1961). PALMER, [EDWARD VIVIAN] VANCE (1885–1959). PEOPLE'S REPUBLIC OF CHINA (PRC). RINEHART, GEORGINA HOPE “GINA” (1954– ). ROBERTS, TOM [THOMAS WILLIAM,] (1856–1931). RUDD, KEVIN MICHAEL (1957– ). SCHMIDT, BRIAN PAUL (1967– ). SINGER, PETER ALFRED DAVID (1946– ). SMART, [FRANK] JEFFREY [EDSON] (1921–2013). WARREN, DAVID RONALD DE MEY (1925–2010). WATSON, JOHN CHRISTIAN, “CHRIS” (1867–1941). WHITE, PATRICK VICTOR MARTINDALE (1912–1990). WILLIAMSON, DAVID KEITH (1942– ). WILMOT, “CHESTER” [REGINALD WILLIAM WINCHESTER] (1911–1954). WOLFENSOHN, JAMES DAVID (1933– ). YEOMANS, P. A. [PERCIVAL ALFRED] (1905–1984).